So today I thought I would talk about what I am doing right now to stop and reverse my vitiligo. The fact that I felt so terrible really surprised me – I guess I hadn’t noticed how much the herbs were helping me. I was going over the ingredients again, and I was reminded that the Vitilax contains herbs that are good for your hormones – Dong Quai and Tribulus. I REALLY noticed a difference in my menstrual cycle when I stopped taking it. I almost couldn’t function, I felt very foggy headed and achy, and I had a nasty migraine. So I will keep you posted on my progress with the Vitilax. I also started juicing – today was my first day. I juiced 5 organic carrots, which gave me 10 oz of juice. The reason I decided to start doing this is because of the recommendation of three different doctors (two of which have vitiligo themselves) – Dr. Ben Kim, Dr. Wanakee Hill, and Dr. Lawrence Wilson. All three of them have stressed the importance of carrot juice for the skin and liver. He recommends carrots and beets for repigmentation because it’s the pigment-rich vegetables that protect the skin against sunburn – which is important when you are trying to increase your sun exposure to regain color. I highly recommend juicing for people with vitiligo or any other autoimmune disease…Juicing predigests nutrients. Fresh juicing circumvents the digestive process, allowing the freshly squeezed nutrients to go directly into the bloodstream. It’s like getting a shot of vitamins, minerals, and live enzymes delivered immediately. I also had a phone consultation with Dr. Hill, and she stressed to me the importance of juicing carrots, beets, and dandelion greens to help cleanse my liver. Those of us with vitiligo need to pay special attention to the functioning of our liver. It’s the liver’s job to filter and remove toxins from our body. But when it gets congested, it can’t do its job properly. When there is a build-up of toxins in the body, these toxins can get into your cell membranes. When this happens, your immune system becomes confused and targets those cells for removal, thinking they are old or damaged. (source) This is one of the ways in which your body can begin attacking itself. People with vitiligo, are shown to have congested livers, so cleansing it and keeping it functioning properly can do nothing but help. 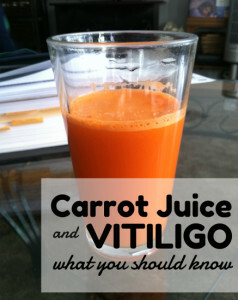 Juicing the carrots was not hard to do at all – much easier than I was anticipating, and it’s yummy too :-). Altogether, from start to cleanup, took about 7 – 8 minutes tops. My juicer is very easy to use and very easy to clean – no more than 5 minutes. This is such an easy way to start getting healthy and helping your body heal. I encourage you to give it a shot :-)! I have vitiligo for almost 12 yrs.already. It really affects me physically and more on emotionally. What I’m doing now is covering it with make-,up and other cosmetics. Can you suggest me of other treatment. How much quantity can drink daily may be better at the morning empty stomach , can carrot and beetroot mix together? so glad I am across this web site! i have had vitilago for a few years now and it is spreading. My cousin recommended a natural approach. to detox liver and take supplements and vitamins. Thank you for your info!! have a great day! I have vitiligo since the age of 12, I am 70, I am taking vitamins B12, D3 1000, Biotin and Centrum Silver everyday, I am juiceing every day with Kale, Spinach, Celery, Apple, Ginger, Red Bell Pepper, so far no change, should I try drinking Carrot Juice? You are so kindly answer everyone! My son is 6yrs old. A year ago start vitiligo in his fingers on right hand. And in the same time is apeared halo nevus in hos back. During the winter white spots aren’t visible a lot but now they are started to be visible. My son is alergic of cows product. Now i have started juice carrote&apples and cows product to avoid. I am very sad about him! He hasnt theroide because lab test is negative. Is necceasy to do others test??? I have vitiligo on my face. It started about 3 years ago with a smallish spot near my jaw. It went insane on my face the last 5 months after I had a crazy reaction to the sun after taking advil. Photosensitivity is what I was told. I have been using my vitamix daily to make veggie and fruit drinks, usually consisting of carrots, greens, beets, ginger and organic juices. Since you mention juicing I am wondering if blending is is still effective? What is the difference? What are the benefits of juicing as opposed to blending? Thanks for your input and many thanks for this blog. Lots of good info. Glad you are enjoying the blog :)! Since those of us with vitiligo have digestive issues and low stomach acid, juicing allows us to get a large amount of minerals and nutrients without having to digest anything. Blended veggies still contain a lot of fiber and can actually be harder to digest because of the raw state of the vegetables. Another reason is that juicing allows you to “drink” LARGE quantities of vegetables that would otherwise be impossible with blending. What’s a good diet for vitiligo patients. I have vitiligo and it’s spreading like crazy. I just hate it. I have vitiligo since age 12 when it started, a little small white spot on the right side of my stomach, i have it on my elbows, ankles, hands, knees, neck, a small spot on my back, i started carrot juice every day, i am taking B12, D3 1000, Biotin 1000, centrum silver everyday, i sit in the sun for an hour, i can see some changes, it is a very slow process, i also juice kale,spinach,apple,celery,ginger. Hi, my3 years old son was diagnosed with vitiligo. He’s derma prescribed a topic creams for some reason when I apply the cream the white patch is getting lighter I stop to use. I want to try a natural medicine. Do you know if carrots juice has to be taking in the morning or any time? What else can I try on him??? Check with your son’s doctor about vitamins and eliminating gluten, dairy and any other foods you think he may be allergic to. Food allergies are common in young children and can contribute to vitiligo. Hi TJ- Your story really related to me because my vitiligo also started after I had my 1st son and at the point my father was diagnosed with lung cancer and passed away. It was a very stressful time not only dealing with a new born but also dealing with the death of my father. I started get anxiety. My vitiligo did get a lot better with phototherapy and its on my hands, but I do notice that when I stress that is when vitiligo spreads on me. I hate it and I just want to get better and not have it anymore. Your blog helps to keep me motivated and to each clean and organic. How are your results coming along? I am so sorry to hear about your father. Yes, stress makes it spread as many people with vitiligo have confirmed. I am so glad the blog has helped you stay motivated. My results are coming along steadily….seems like I get new freckles almost daily. Thanks for visiting, and take care! I have vitiligo, Had problem with yeast overgrowth as well, now I have the yeast under control, but my liver is still congested. Do you have any idea if juicing carrots can be done when yeast overgrowth is there( just want to make sure, as I don’t want to introduce something which may have some good effects but can worsen my yeast problem). Also did you prefer blender or juicer for vitiligo. I think it can, but I am not entirely sure since carrots are high in sugar. And I would definitely juice them rather than blend them. In all honesty, the dermatologist will not be much help because vitiligo is an internal issue, not a skin disorder. The most they can do for you is give you some Protopic, which may help the vitiligo on her face. But it likely won’t stop it from spreading any further since the internal imbalances need to be corrected first. Have you looked into taking her to a holistic or functional medicine doctor? I feel so bad I never responded to this! I’m still beating myself up over this. I used to give her 1000iu of vid d in the winter months and think that maybe that over stimulated her immune system. I took her to a dermatologist and he scared her to death and told her she is more susceptible to skin cancer and told her to wear special clothing! She left in tears and now doesn’t want to do anything to try to make it better! I’ve heard of black pepper oil (forgot the actual name) and also another vitamin phenylalanine but no one knows too much about it. Thanks for visiting the blog – and I am really to sorry to hear about your little boy. My little boy is four years old as well, and I can’t imagine what it would be like if he were going through this and not me. I think it would be much worse for me to deal with, so my heart goes out to you ;). Carrot juice would be great for him to drink! Maybe just 3 oz or so because it is a bit sugary and sweet. I don’t actually have a doctor, I work with a nutritional practitioner – you can find one here if you are interested: http://drlwilson.com/do%20hair%20analysis.htm. I have my son on the same program, so your son can do it too. Nutritional Balancing corrects the body and balances the immune system – which is why it works so well. It is a bit pricey, but to me it has been so worth it. Hi! My 3 yo son was just diagnosed with vitiligo this week. The only white spots he has right now are in his hair. I qas wondering if you tried the juicing woth your son and if it helped at all. The derm we see prescribed a topical steriod to help regrow hair. I’m sorry about your son. I juice carrot juice everyday…you could try giving him 3-4 oz a day. It helps cleanse the liver. I have had Vitiligo since 2012. Not sure what started it. I was 36 when it came around my eyes first & now it’s spreading all over my body. I noticed you mentioned cleaning your liver. Do you have a recommended remedy. I do coffee retention enemas to clean my liver. It may sound extreme, but it isn’t and is very powerful. You can read more about it here http://www.drlwilson.com/articles/COFFEE%20ENEMA.HTM. Also, Dr. Wanakee Hill recommends Picrorrhiza as a powerful liver cleanser. I also drink carrot juice daily. Hope that helps! I have vitiligo from past 15 years and i was pretty healthy all along and it didn’t spread much. I am in my 30s now and i see vitiligo spreading to other body parts rapidly. I was concerned and started gerson therapy from past 4 months and i see some remarkable improvement. My white patches started pigmenting. I drink 1 liter of carror-apple juice first thing every morning. I recently found out about the Gerson Therapy and I am starting it now. I have had vitiligo for 9 years. It is great to hear that you are having good results. Is still working for you. The Gerson therapy is good, just make sure you are getting enough COOKED vegetables in your diet. Thanks for visiting! Thank you for sharing this article.. I have Vitiligo for the last 3 years and I’ve been using different medicines. There’s little improvement in pigmentation but the white patches on my nose and lips aren’t reducing. After reading this blog, somehow my conscience tells me that it will work if followed religiously and I have started taking Carrot-Beetroot Juice. Today is my first day and I drank it just before I started writing this.. If it works, I’m gonna recommend this every vitiligo patient out there.. Good luck. Thanks for your comment! Yes, all the natural treatments I have discussed here take some time to see results. Keep it up, it took me a year or so before I started to see any pigment returning from my treatments 🙂 Take care! Thanks for visiting the blog! What was happening in your life when your vitiligo started?